The 2000 Jeep Cherokee. 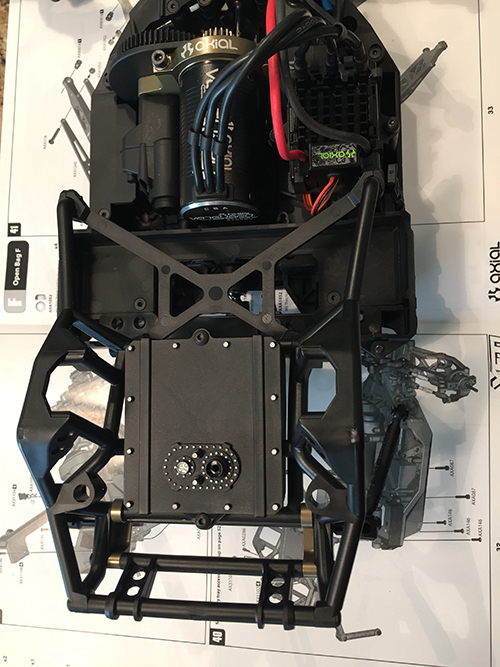 Watching the livestream of the release of Axial’s new SCX10 II platform brought back flooding memories of my high school days. I lusted, dreamed, and tried to finagle a way that somehow, someway I could own that Cherokee. 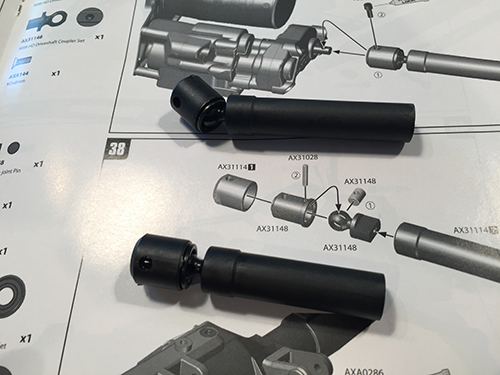 My dad worked at a Jeep dealership so I had spent many a days walking the lot, reading the brochure, picking out option parts, changing my mind, and then picking different parts and accessories. I had the entire build down to the lug nuts and blinker bulbs picked out, dreaming and wishing it would be in my driveway one day. Throughout high school, I spent many weekends working on my buddy Alan’s ’89 bright yellow Cherokee. 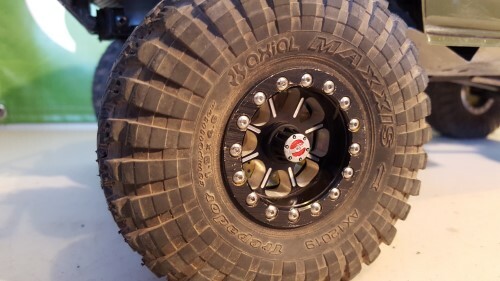 It had 33” BFG Mud Terrains and a custom suspension created à la carte with parts from multiple brands; I will still never forget installing the formerly awesome Tereflex Revolver rear shackles. 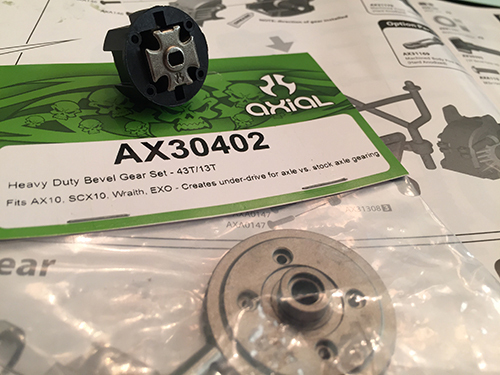 We had a silly fascination with articulation and slamming wheels into the wells to get that super coveted “tuck” (A dream still being chased after by Axial’s own John Schultz). Instead of chasing girls and going for ice cream, we were chasing bolts and building wheeler dreams. 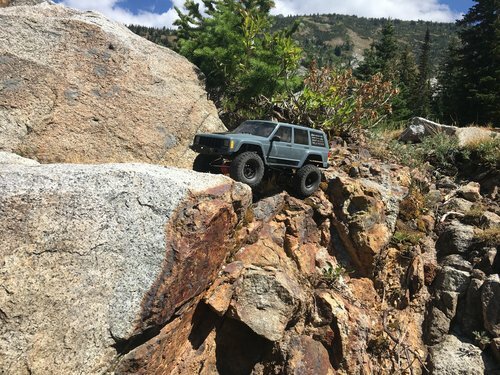 It was a blast wheeling in his Jeep and it fueled my desire even more to have a Cherokee of my own. 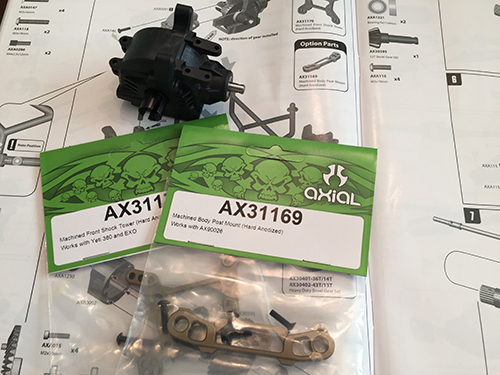 I had watched how it performed at AXIALFEST this summer and I was excited to see how it would perform on my local stomping grounds. I grabbed a battery and headed for the granite slabs of Northern Utah. 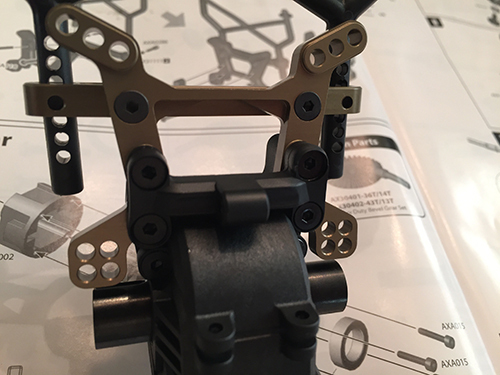 Out of the box, it’s an amazing rig with turning, climbing, looks, etc. I was in love after just the first climb. 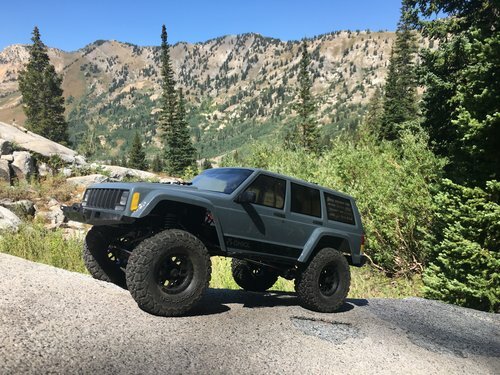 I feel like I have a lot of catching up to do as I never ended up owning a Cherokee but I have never lost the love and admiration for the XJ. 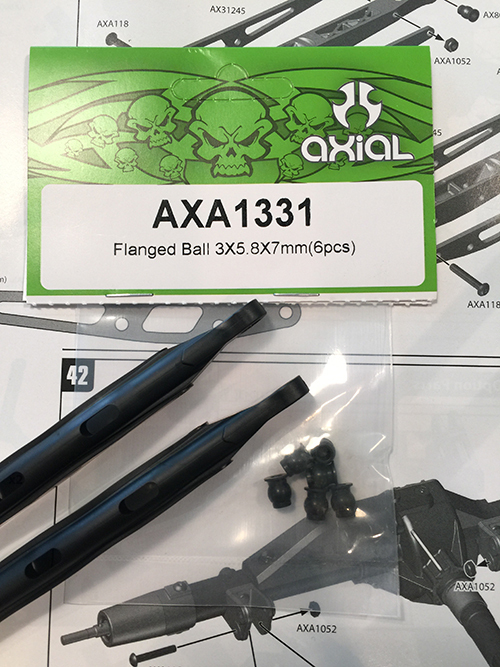 Thank you Axial for allowing me to take a journey down memory lane. 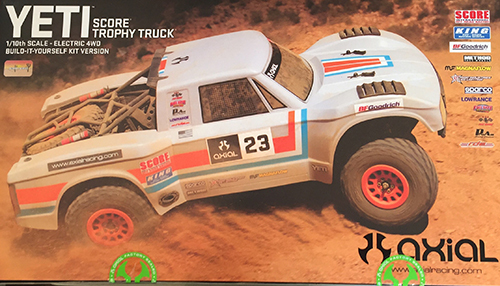 The Axial Racing Yeti™ SCORE® Trophy Truck® kit includes many of the necessary upgrades that will bulletproof your Yeti™ for the desert but, if you want a bomb proof Yeti™ that will survive almost anything, Axial has you covered! 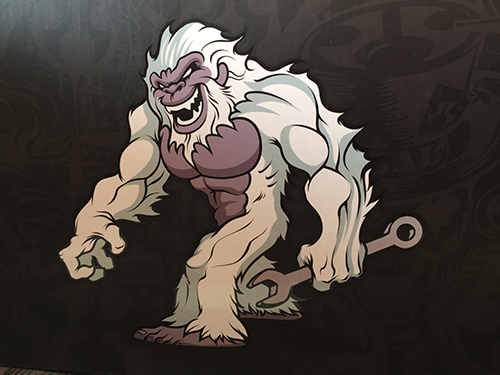 When first receiving the Yeti SCORE Trophy Truck kit box, the artwork is second to none, even the inside will wow even the expert builder. 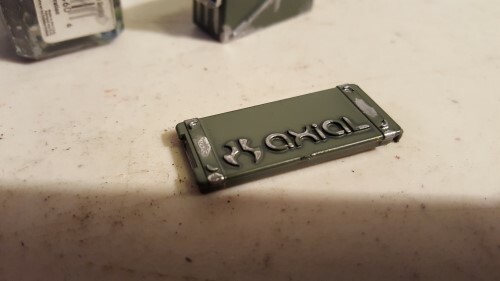 The box contents are neatly packaged and clearly labeled. 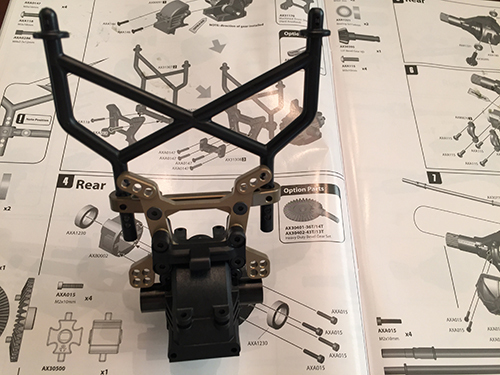 The instructions start out with the front differential. The instructions include suggestions for optional performance upgrades. 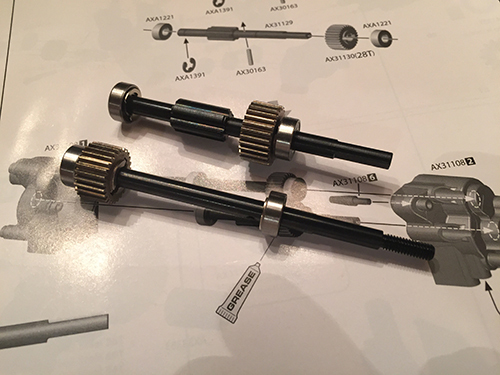 Using these heavy duty over/ underdrive differential gears will yield different speeds and off road handling results. 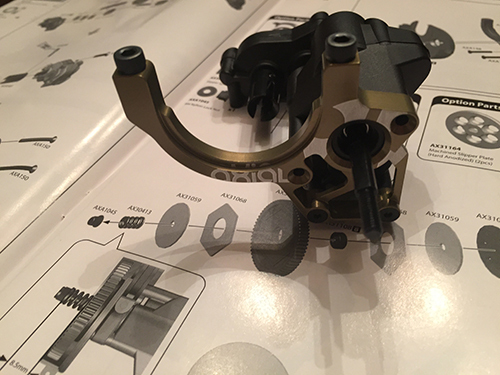 Overdriving the differential will increase higher speeds, but decrease low end torque while the underdrive set will do the opposite and can be used in conjunction with each other as well. 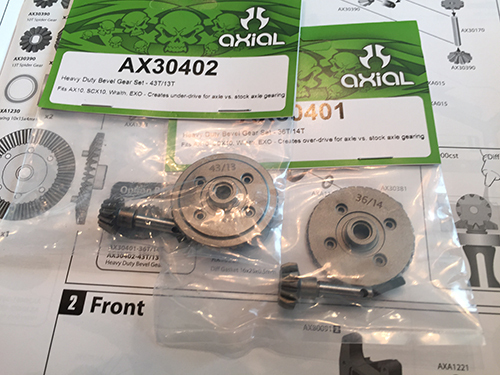 (AX30402, AX30401). 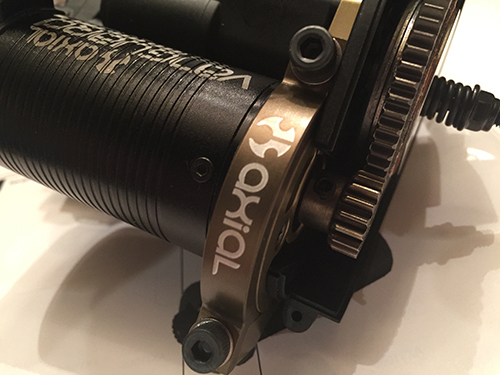 Next is the front suspension and body mount steps, the aluminum shock tower (AX31170) is an essential upgrade to improve shock performance over the plastic piece by minimizing any movement in the upper shock mounting area dramatically. 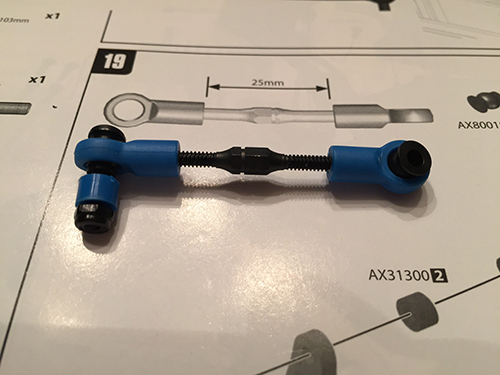 Also an area that is often overlooked is the body mount (AX31169). By improving this area, it will help to decrease front body movement. 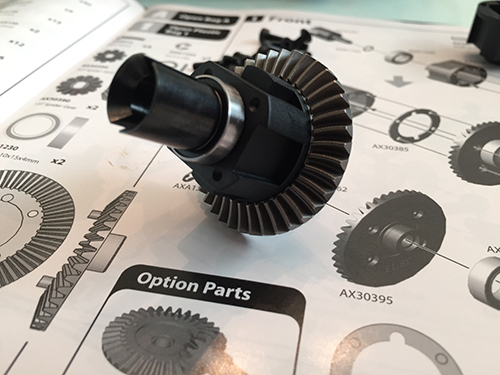 For the rear axle, the heavy duty over/underdrive differential gears are also available (AX30402, AX30401). 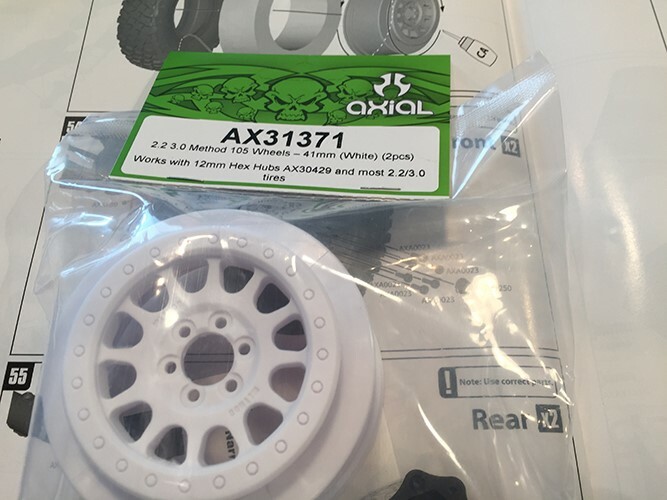 The AR60 axle includes a removable scale plastic differential cover in the kit, these are two of the optional aluminum covers (AX30829 & AX31429) which offer a better seal and protection. 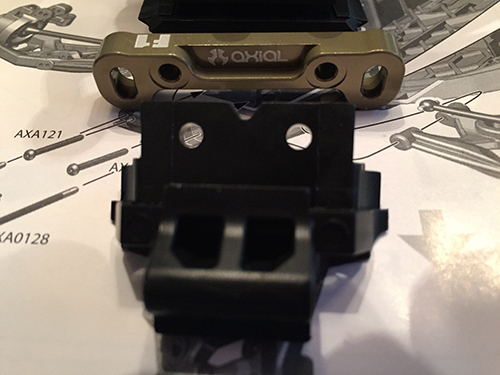 There are also 2 different choices for aluminum link mounts, each ones have different performance advantages. 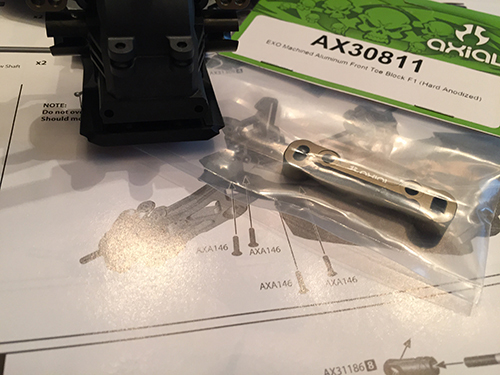 The AX31433 gives you the option to mount the rear sway bar on top of the rear axle, while the AX30830 will allow you to dial in the rear link length and pinion angle. 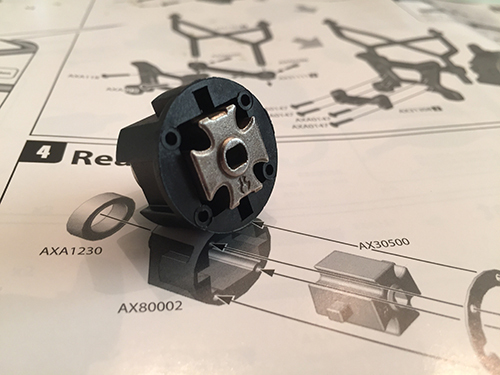 When building the front independent suspension, using the aluminum front Toe block (AX30811) will keep the suspension arm hinge pin securely in place and also offers greater front end protection over the plastic part. 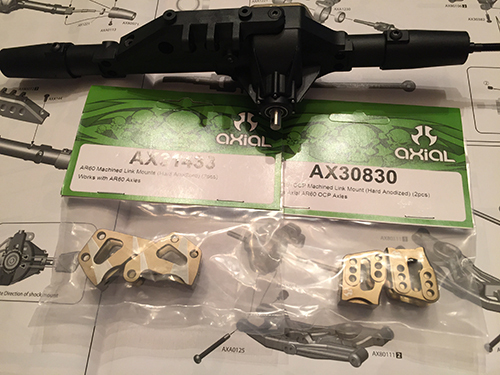 Note that parts tree AX80100 is needed when ordering this piece. 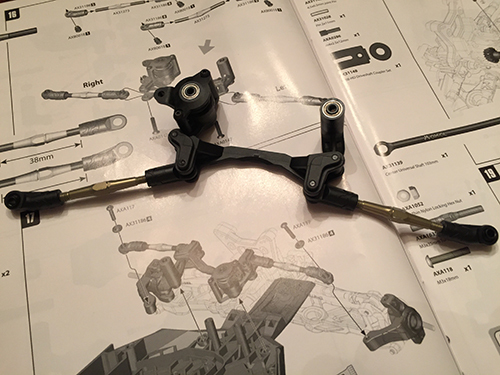 Continuing on with the front suspension build is the front steering and camber links. 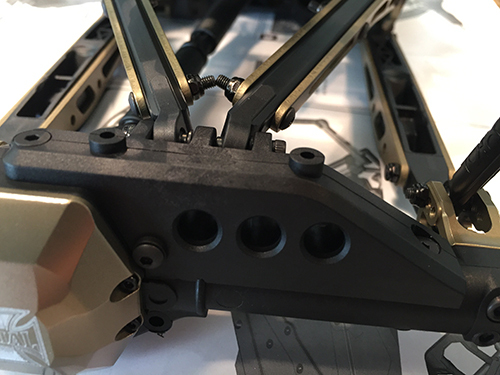 The optional Yeti aluminum turnbuckle kit will decrease weight and increase front suspension strength. 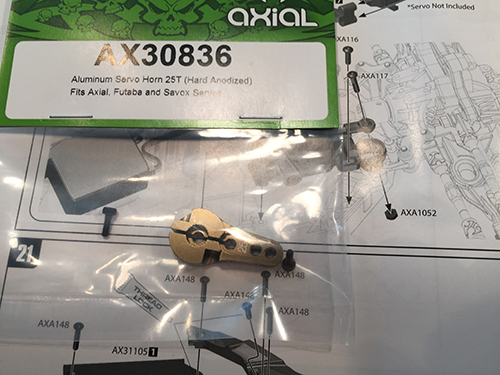 When installing the servo, using the AX30836 aluminum clamping servo horn will help to increase the servo’s life by not allowing any flex or any servo/servo horn teeth breaking. 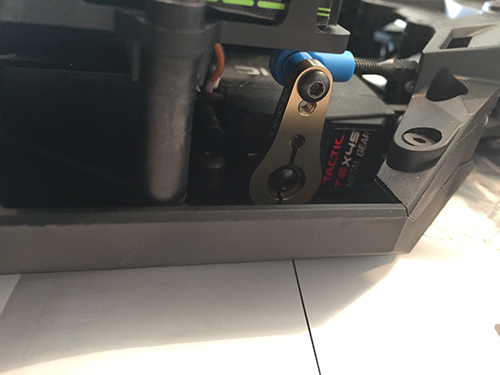 The Yeti has a sealed gearbox and transfer case that includes metal gears that can handle the abuse of a brushless motor and ESC combo on 3S easily, one part in this area that can use improvement is the motor mount (AX31156), it allows the pinion and spur to spin freely and efficiently by keep the motor solidly in place. 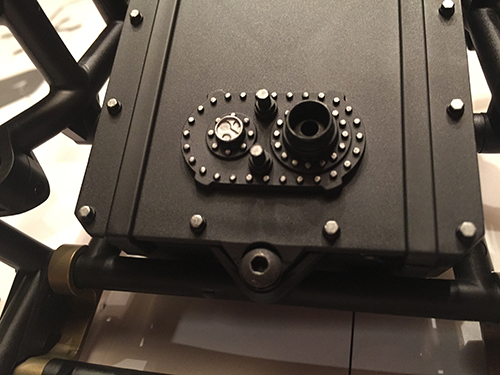 After installing the motor mount you have several Axial spur gear options that allow you to dial in your Yeti’s speed and torque characteristics. 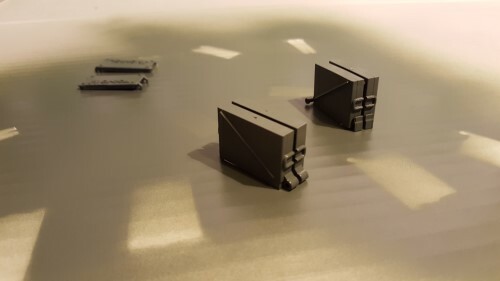 Using the 64T spur will increase run times and torque while using the 56T spur will decrease run times but increase speed. 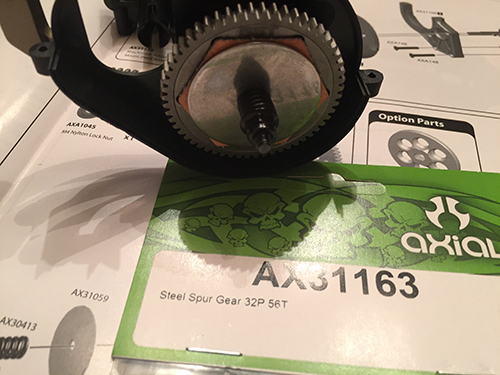 Opting for the steel spur gear will minimize any broken teeth, just make sure proper gear mesh is achieved. 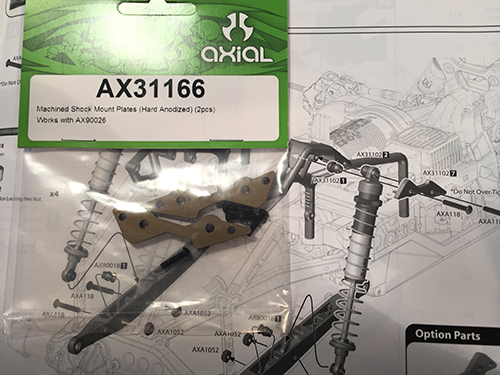 When building up the rear suspension, using AXA1331 will help the rear links move more efficiently than the comparable plastic versions. 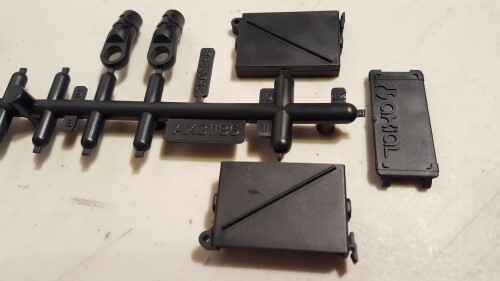 The Yeti Score kit includes aluminum lower link plates to help increase the trailing arm strength. 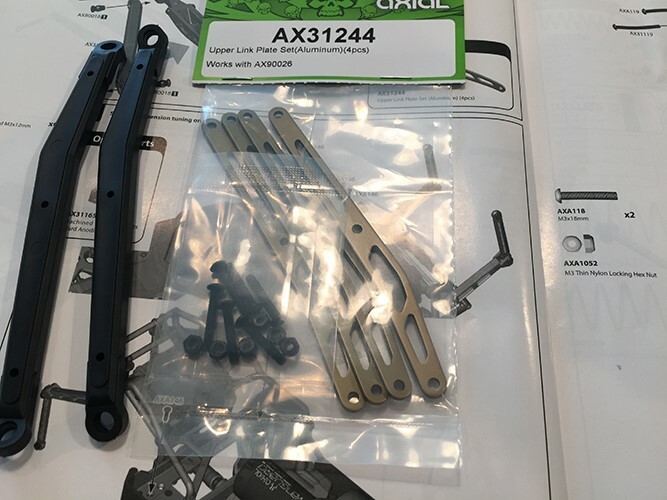 Upper aluminum link plates (AX31244) are also available to minimize any flexing or link breakage that may occur while conquering Baja. 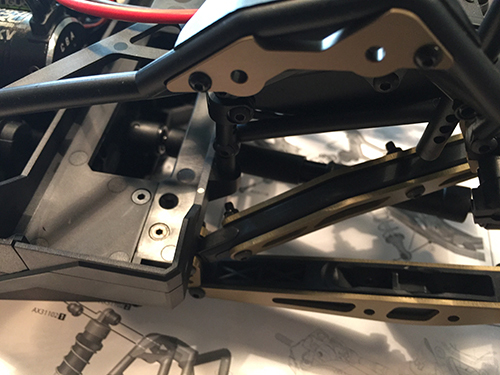 When attaching the rear links to the chassis tub, an often over looked part is the chassis link mount. 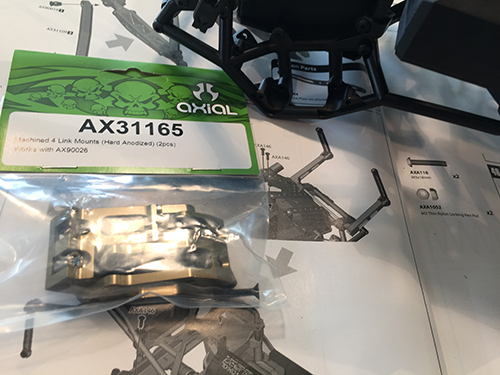 Axial’s AX31165 aluminum link mounts will complement the aluminum upgraded suspension arms by not allowing any flex in the mounting area and allow it to move freely. 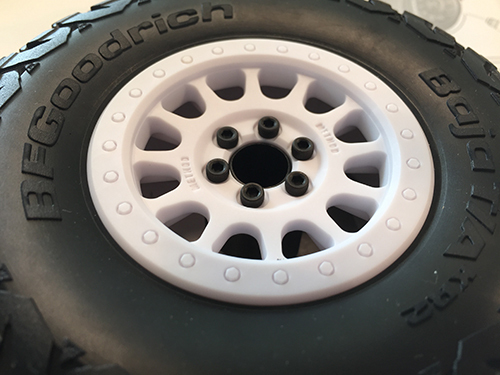 Also available are officially licensed Method 105 wheels in kit stock orange or optional green, white, and black to keep you visible and add some authentic racing flare. 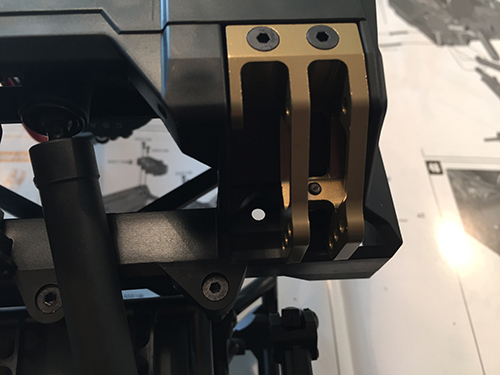 With the shock build and installation, using the available hard anodized aluminum shock mounts (AX31166) will create a more sturdy mounting area as well as help with the suspension travel. 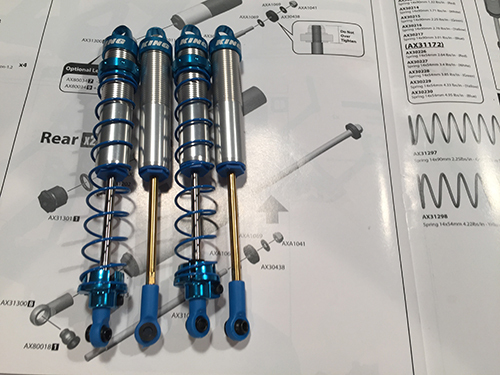 To increase the visual aspect and the durability of the shock, use the available licenced Aluminum King Racing Shock caps, collars, and spring retainer cups (AX31430 and AX31431). 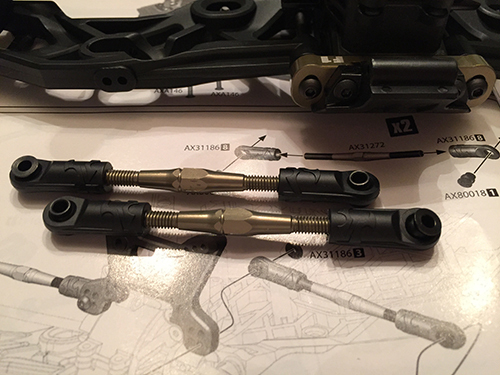 The rear shock mounts and on the trailing arms allow for several different ways to tune your shocks, you can also mount a second set of shocks to help increase the dampening ability. 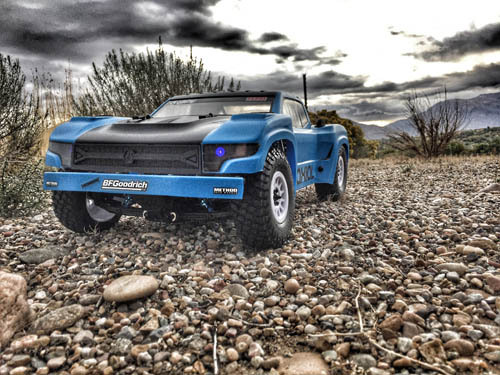 The last time you saw this Honcho RTR, it had some noticeable changes to the exterior. 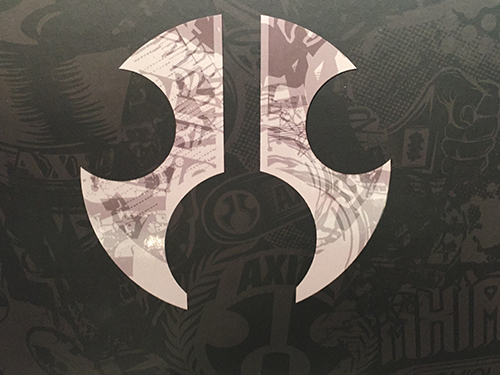 If you missed the first part of this blog, you can check it out here. 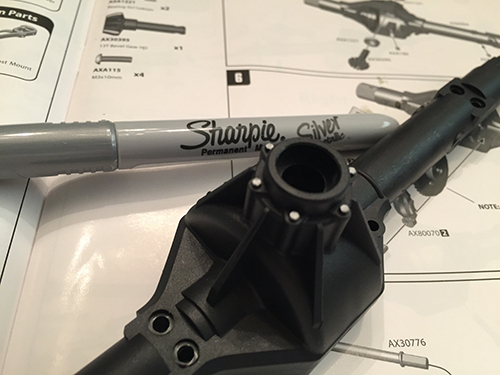 If you added those details on your vehicle, hopefully yours now stands apart from the rest. 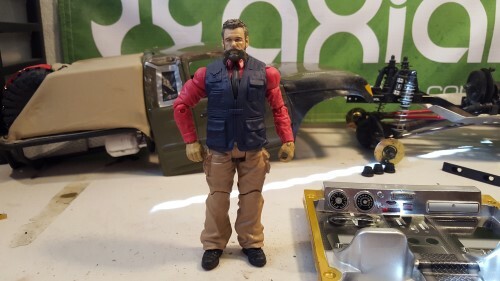 Now its time to add an interior and a few other details to complete the look. 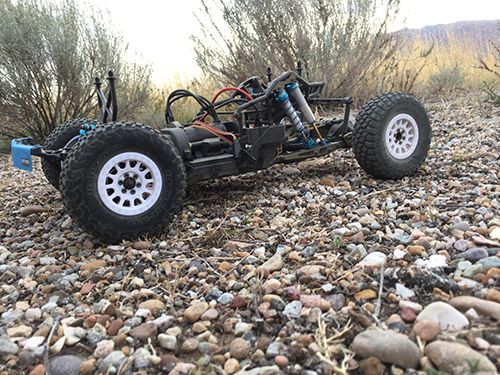 This was my Axial Dingo I ran for a while, I keep some of my old bodies for this exact reason. What reason you ask? Well, myself and I’m sure hundreds of others do this. 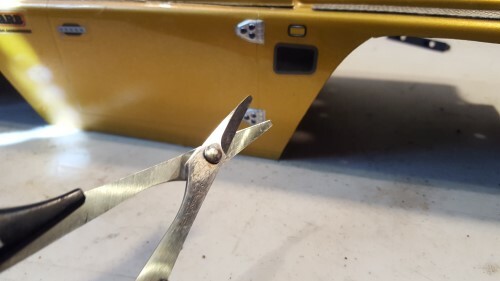 Some of our RC bodies go under the knife, well body scissors actually. 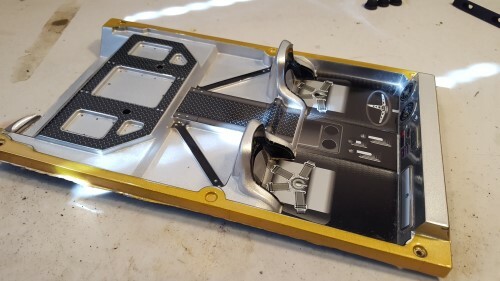 One of the coolest things about Axial bodies is that they have an interior that can easily be put into another body. 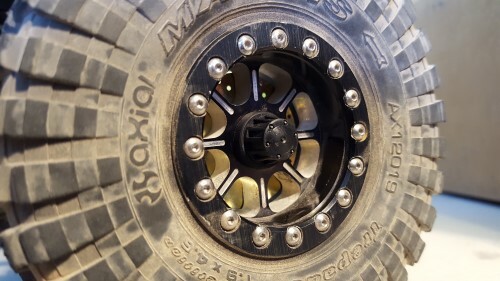 This Axial Dingo is the donor for the Honcho RTR project. This is where you can really get creative. You have almost limitless options, I am just going to show you a basic way to get started. 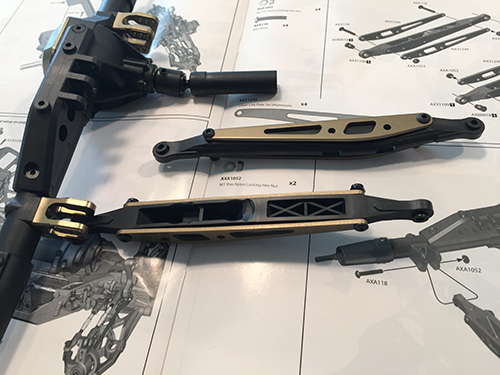 You can paint this to match or make it custom. 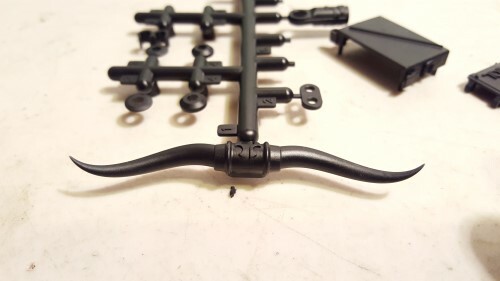 I would suggest painting it with a matte or satin, doing this helps sell the overall look in my opinion. 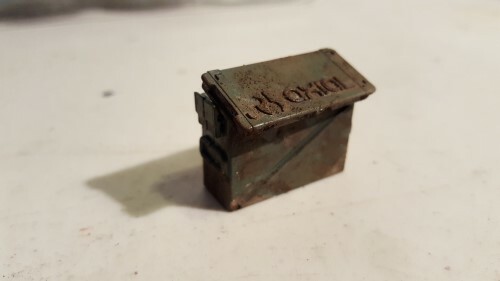 The silver works for this project so I am not going to paint it. 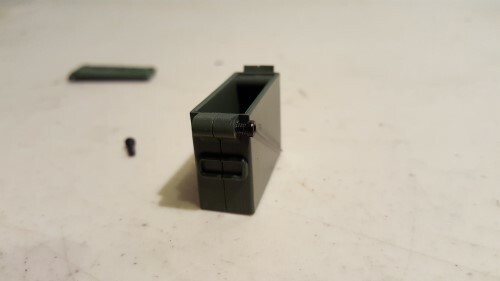 Obviously you will need to make it fit. 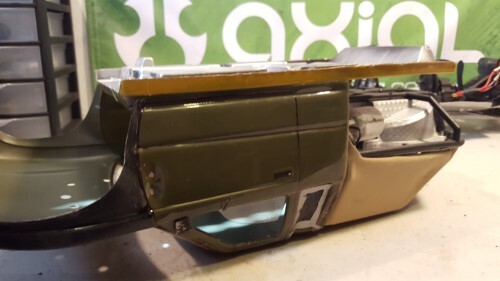 My starting point is always the dash, as most people will notice the dash before they notice the extra cab. 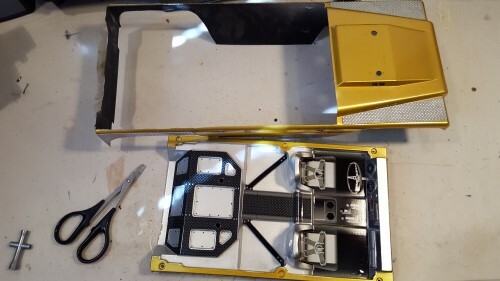 I always trim the interior to be bigger at first, then I’ll start fine tuning it on the fitment. These interiors always seem to fit so well, like I said, myself and others have been doing this for years. 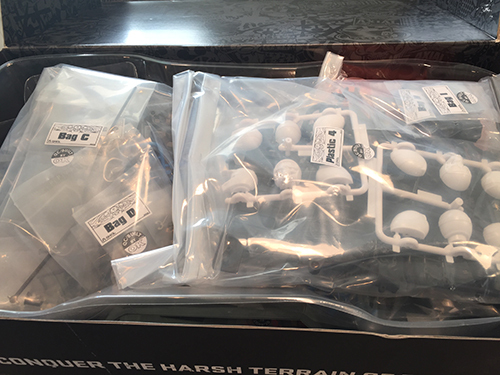 If you’re not a scratch building styrene expert yet, I wouldn’t worry too much. 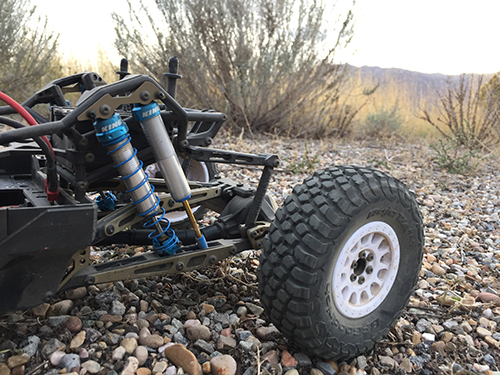 You can still be scale on the trail with this. 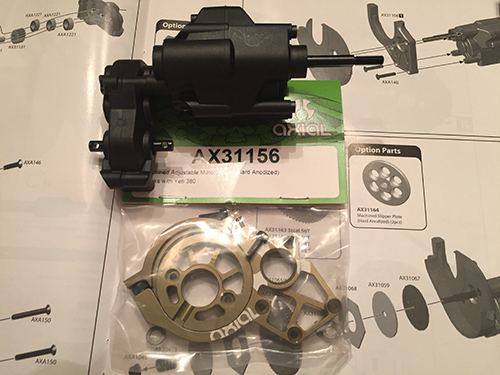 Don’t go right to installing it just yet, this is where you get to be creative. 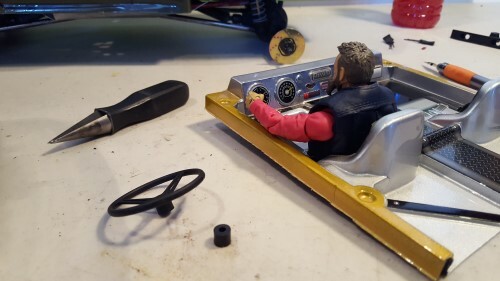 I am going to add a driver. There are a number of places you can get a driver. 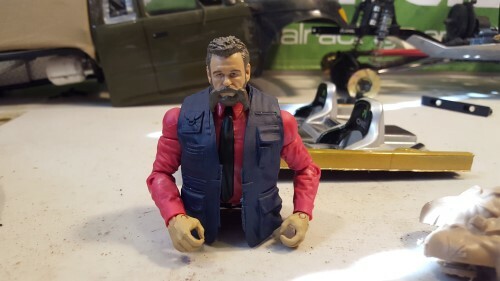 Expect to pay $10 to $30 dollars, possibly more if you want a seriously scale action figure. 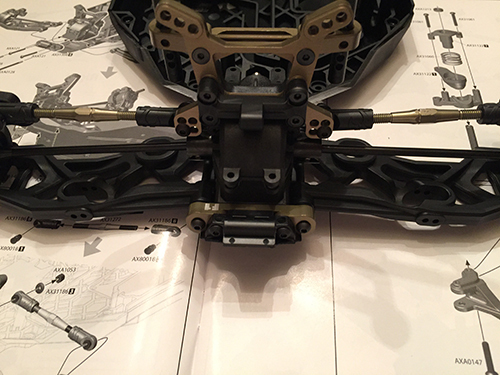 Things to know: some guys will skip this all together because they want a serious performance crawling RC. This is definitely a scale feature, but that’s what this project is about. Doing this will affect your COG (Center Of Gravity), and that’s why some do not do this. 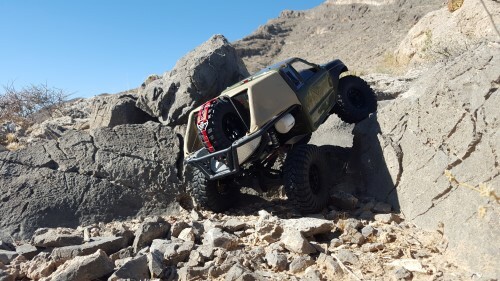 I however like the look and drive scale, so you are not likely to see me climbing a 3 foot vertical rock anytime soon. I drove competitively back in the 2.2 comp days and now I find more fun in this style. To each their own and do what you enjoy because this hobby should always be fun. 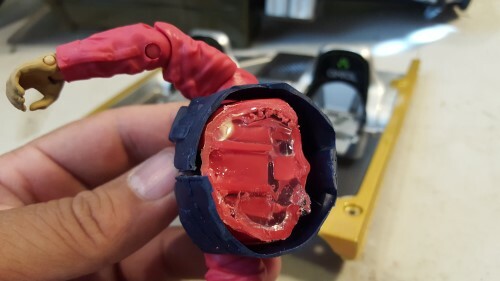 After you have spent your hard earned paycheck or allowance, break out the dremel and cut your new driver in half. 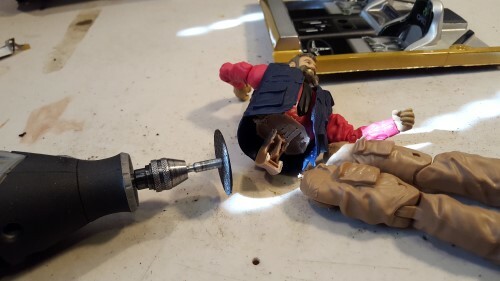 You can also use a saw for this. 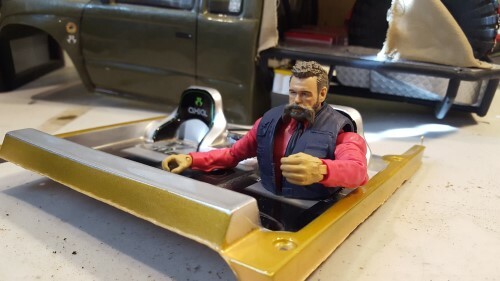 There is not really a wrong way to do this, just keep test fitting him so he fits in the interior while inside the truck. 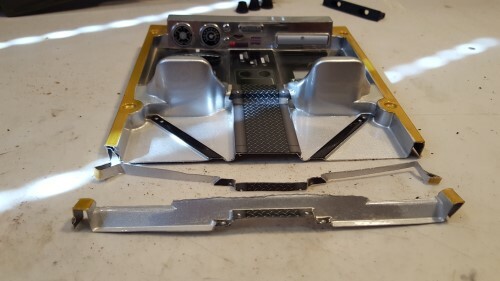 Here is my driver cut in half. Notice how much shorter he is in the picture below, so you may have to do some more trimming. 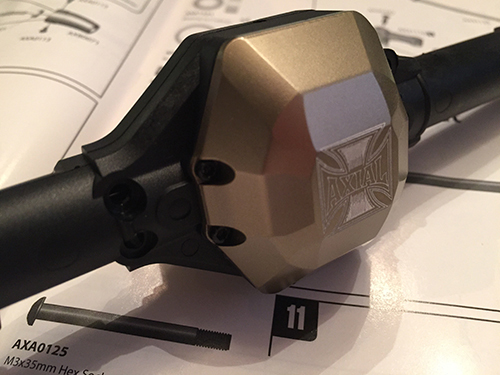 Smear some trusty shoe goo on it (or whatever you like to use) and install your new driver. 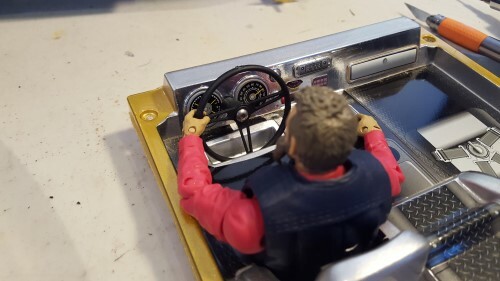 I always like to add the steering wheel, so it has that scale appearance. 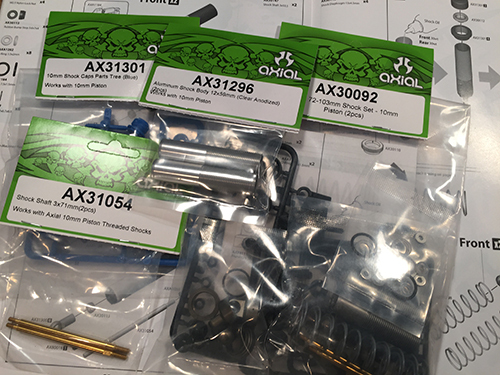 It’s nice to have a few AXIAL AX80037 parts trees on hand; they have some cool extras on there like a choice of steering wheels, rifles, and mirrors. 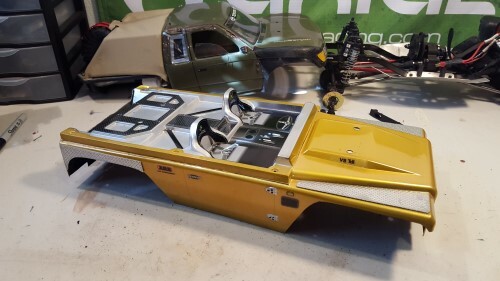 You can add anything you can think of, shifters, CB radio, GPS units etc. 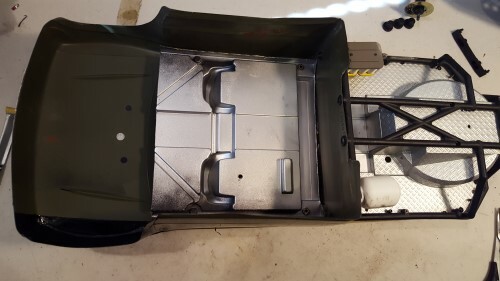 I add some Shoe Goo on the dash and use the screws for middle of the Honcho cage pictured below to support the rear of interior. 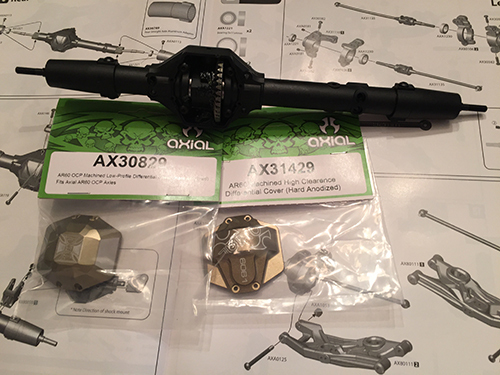 Here are the 3 pieces to Axial Ammo Cans, and on the other end you can find these Long Horns. 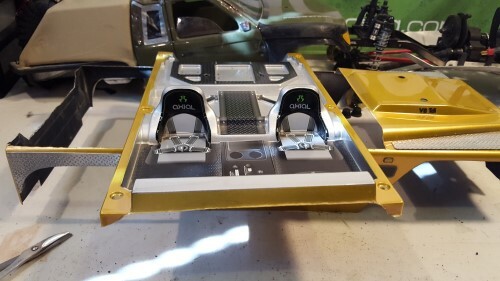 I am going to make 2 Ammo Cans to go on the bed of the Honcho RTR. 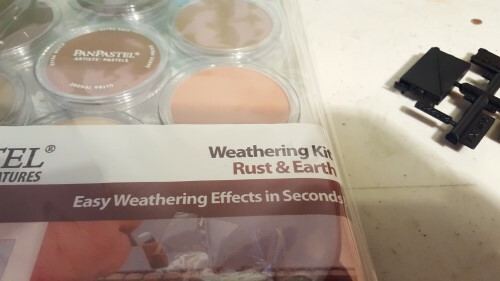 I am going use this quick drying paint. 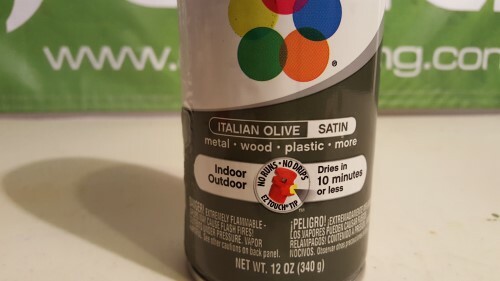 It is Italian Olive with a satin finish. 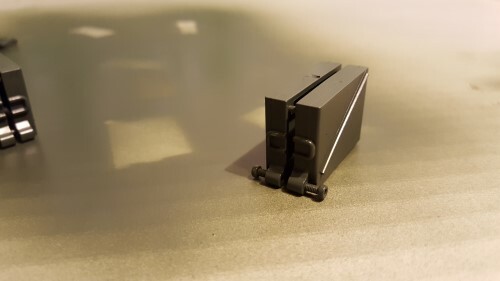 I couldn’t find it in a matte finish or I would have used it. 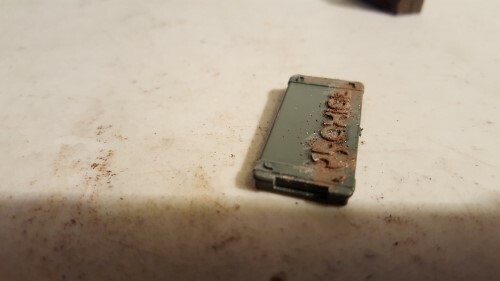 I am shooting it in pieces so I get a good coat of paint on the inside too. 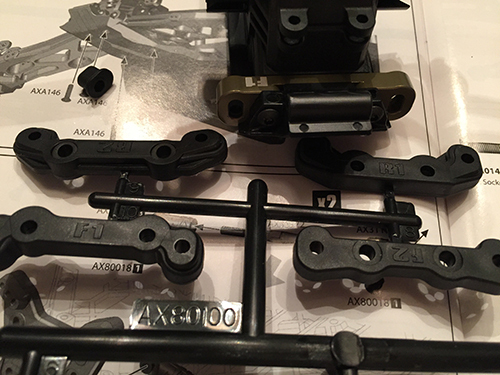 Once I get on a few good layers and it dries, I will partially assemble it. 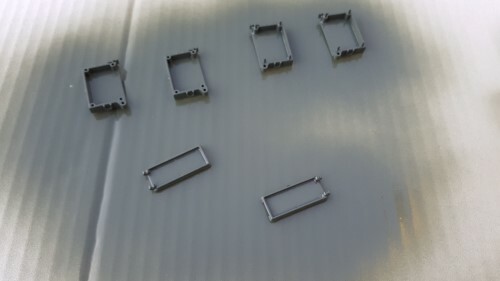 I’ll do a few more layers while its partially assembled. 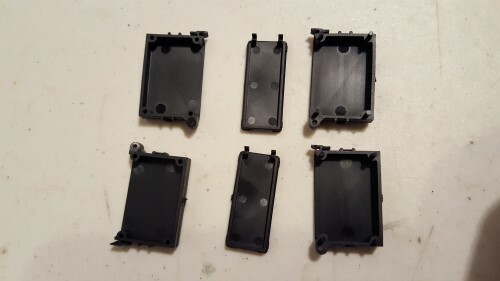 Then I add the screws I am using and partially screw them in. I partially screwed them in so I could hit them with some paint. 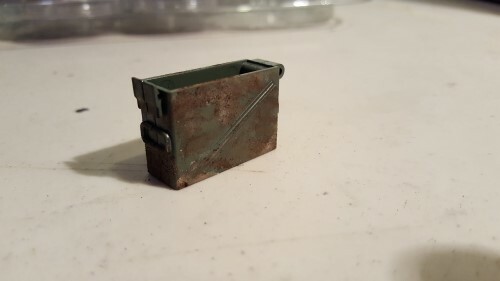 Most Ammo Cans are all one color of military green. 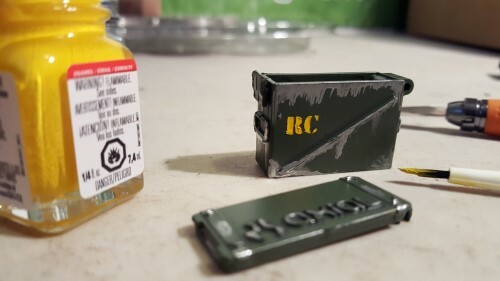 Don’t forget to paint the lid, top and bottom as well. The picture below is my end product, well sort of. 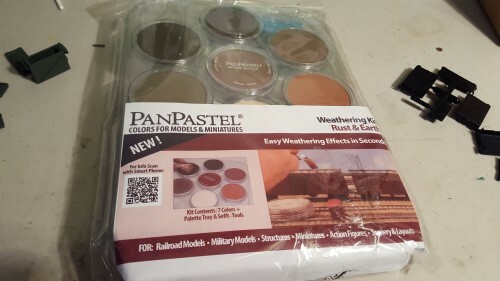 Now I am going to use the PanPastel Weathering Kit. 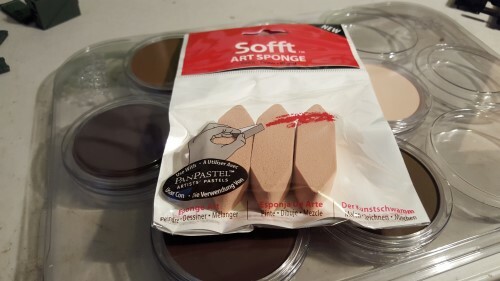 Used mostly on models and dioramas, it will also work perfectly for this project. 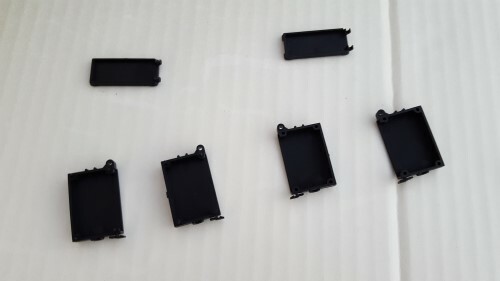 You can also use paint, but this will be much easier. 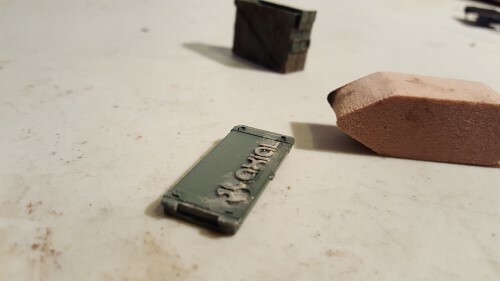 I am using the PanPastel art sponges to apply my weathering. 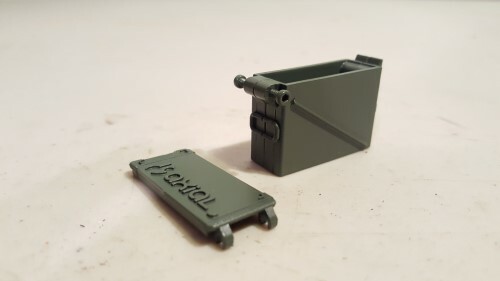 This is a kit that has everything available. So let me show you how it works. 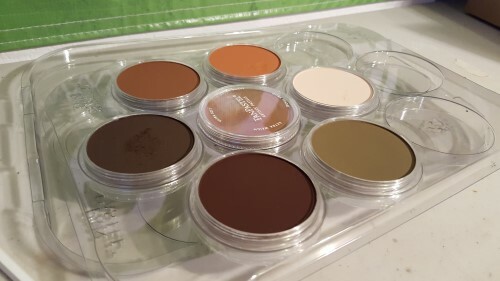 Here is one pallet of colors pictured below and there are several different pallets of color available. 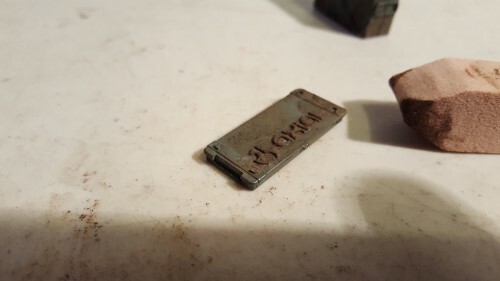 I am going to start with the white, imagine how rusted items look, if they are worn they tend to go to the metal, so that’s where I will start. 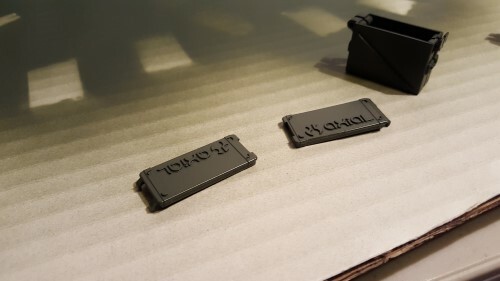 Next I am going to go to a darker color. 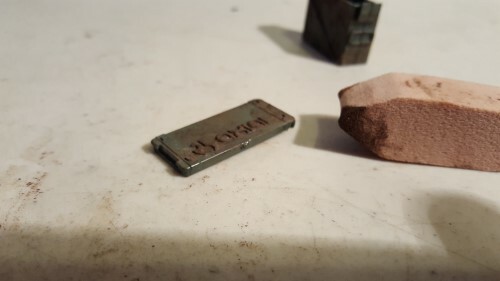 When doing rust like this, layers works best. Don’t be afraid or intimidated, you may surprise yourself. I’ll actually use lighter browns over the dark I have applied. You can see the results so far. Next I will do the lid. Use the same technique with layers. 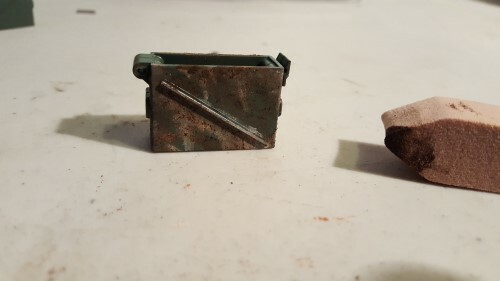 Once you have what you think resembles rust, you are done. I am calling it good with this look. Results are pictured below. I’ll do another one using paint. 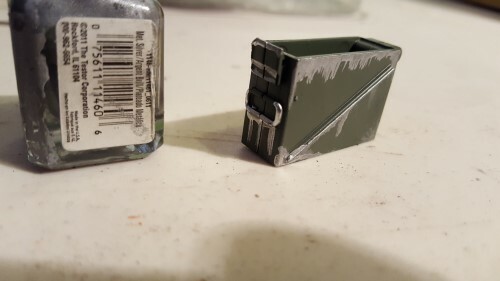 I am using the military paints in matte finish from a local Hobby store. 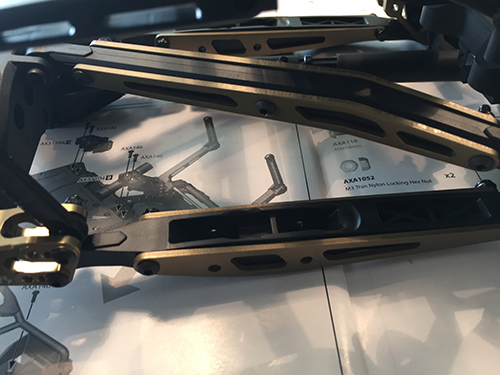 Just this bit of flat yellow helps add to the look as well. I am doing a new looking can as well. 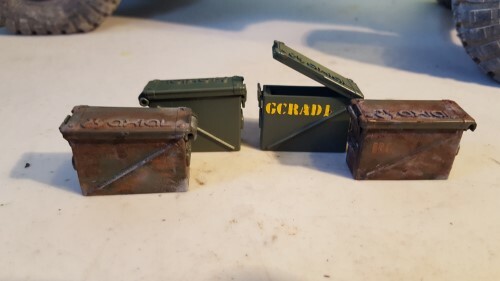 Here are the ammo cans I did pictured below. 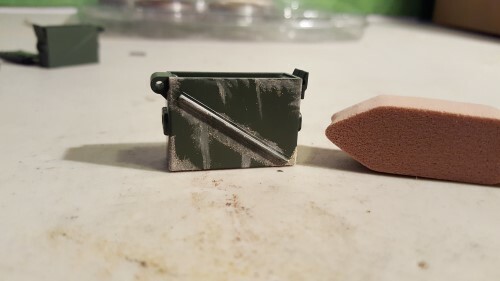 A new look, a military look, a rusted can with PanPastel, and a rusted can with modeling paints. 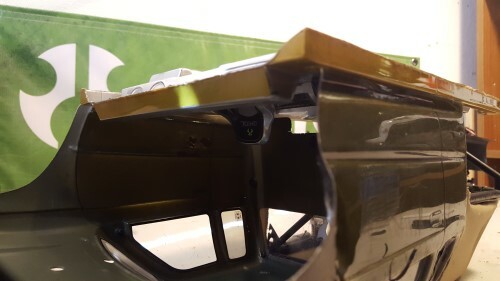 The paint colors are brown, light brown, rust and silver. I also diluted the browns with paint thinner so its transparent. 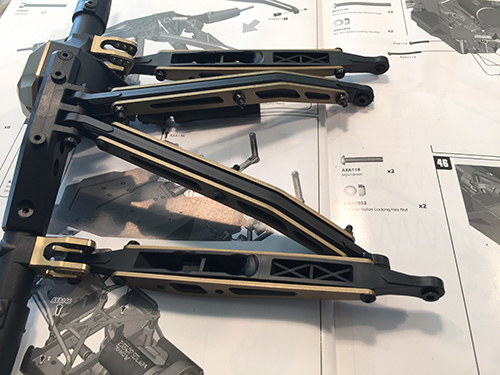 Expect a lot of wait time on paints drying, a day is optimal, especially using thinner. 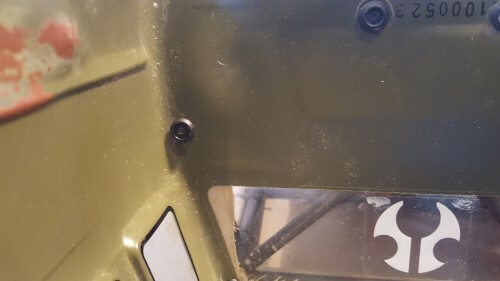 Here are the ammo cans on the RTR Honcho project. Not done yet though, I’m am going to add another small detail while I have the paints out. 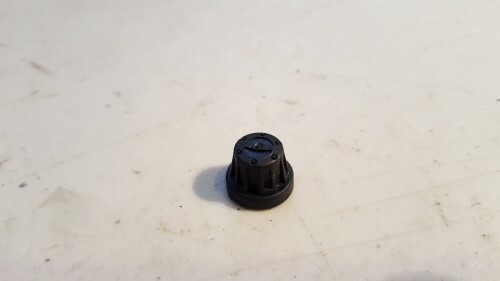 I am going to use the stock Axial wheel caps, these work with quite a few wheels. 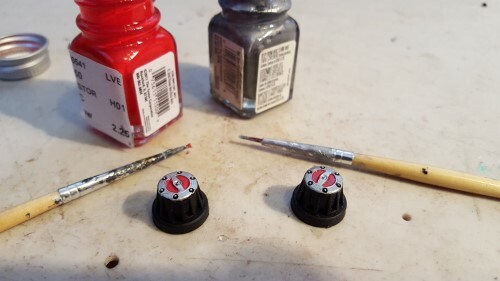 Here I am using model paints in silver and red. 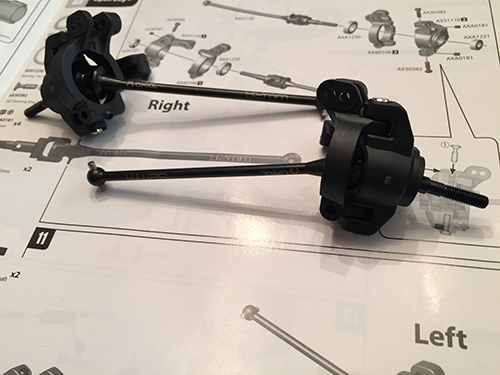 You can make some scale hubs for under $10. 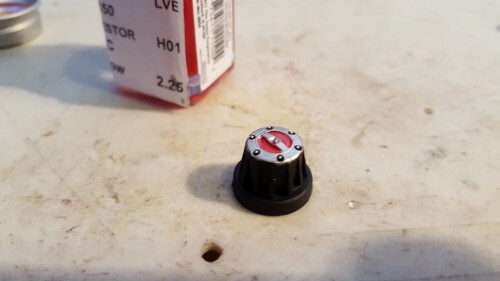 Paints are still out, so I’m also going to hit the rear with a few dots of silver on the bolts. Pretty good look if you ask me. 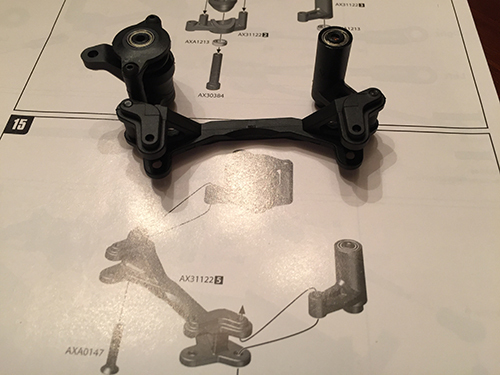 Yes there are aluminum hubs out there available. I even have some, but I love to see people create and use their imagination. 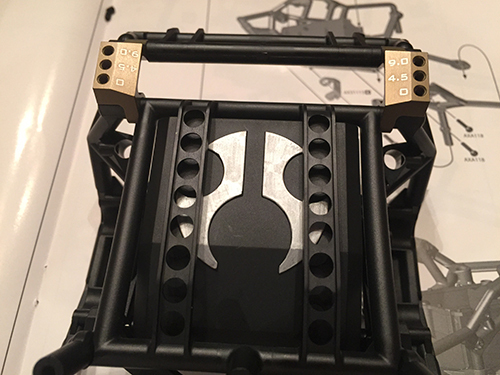 Hopefully you found this inspiring and got some ideas of things you may want to do on your scale rig. 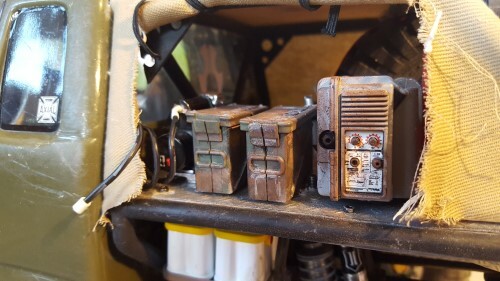 One of the best parts of the hobby is making it your own, the other part to that, is for all of us to see it. 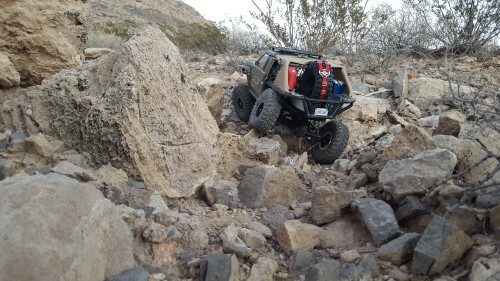 Maybe I will get to see your scale rig out on a trail. 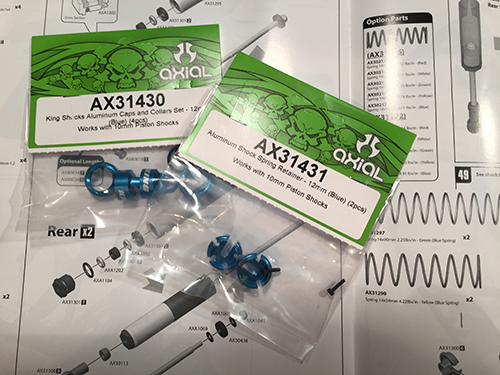 If not make sure you share your pics and builds on Axial’s Facebook. 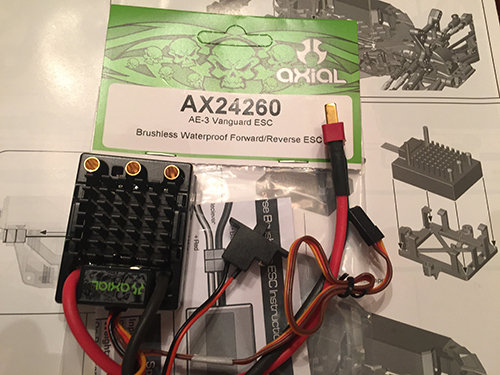 I am always a fan, so I’ll be surfing the page for your cool builds. 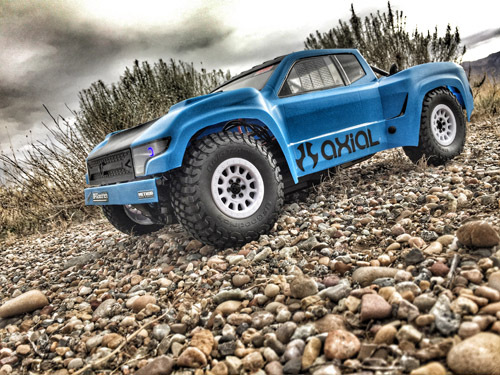 Thanks for checking out the RTR Project and scale on!